We have fine-tuned Infrared technology and created a long-pulsed IR called VermaDerm. IR is considered a gold-standard in aesthetic treatments and is used for a variety of applications such as lax skin, textural improvements and body contouring. Our VermaDerm technology is based on a wavelength that ranges from 850 to 1750nm. This long wavelength effectively penetrates the deeper dermal layers and reaches up to 4 mm subcutaneously. 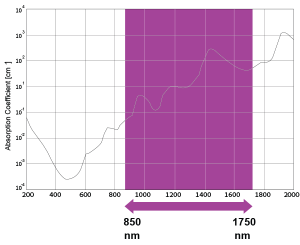 The LP IR energy is delivered in multi-second pulses with the total fluency ranging from 5 to 60 J/cm². By adjusting the fluency, you can control the thermal effect and the temperatures that reach the different tissues within the skin. The LP IR energy is absorbed by the Intracellular Fluid which acts as a chromophore that warms up the collagen fibers. The heat causes the collagen fibers to contract, yielding immediate skin tightening. Repeat heating stimulates the body’s wound healing response in which the body produces new collagen and elastin. As a result, long term skin tightening and firming are achieved. Our LP IR handpieces are equipped with a sapphire contact cooling mechanism which protects the epidermis layer.